Hey Bandcamp, let’s talk about this. Thing is, the limitation here is you, not iOS. If you’d just given me a direct link to the file, I actually could use it on my iPad. Because, you see, there are many third-party applications for iOS that allow you to download files and do something with them. Don’t believe me? 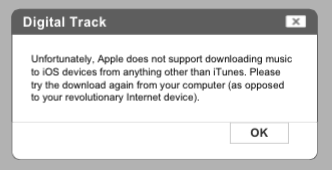 Search the iTunes store for, well, “download files”. And that’s not even all of them. In this case, I would have used GoodReader, which could then send the file to my Dropbox account. Once there, it would fly through a series of tubes to my desktop computer, where it would automatically get sucked into iTunes. Next time I synced any of my iOS devices, that song would be there. It’s kinda magical that way. Yes, it would be ideal if I could download any MP3 from the web directly into the Music app, with no worries of hackers using this to attack my device. But no system is perfect. In this case—and in lots of cases, actually—the simplest solution is best. Just give the user a file link, and let them determine what to do when they reach the limits of their device. But ya know, snark is useful to. Not to your users, necessarily, but whatever.